Denny Hamlin finished 25th in Saturday night’s NASCAR Sprint Cup Series race at Daytona International Speedway after being collected in a Lap 153 incident in the 160-lap event on the 2.5-mile, high-banked oval. Hamlin was charging to the front with drafting help from teammate Kyle Busch as the checkered flag neared, but contact from another competitor on the frontstretch sent Hamlin’s #11 FedEx Office Toyota spinning through the infield grass and back onto the track, where he was hit multiple times. 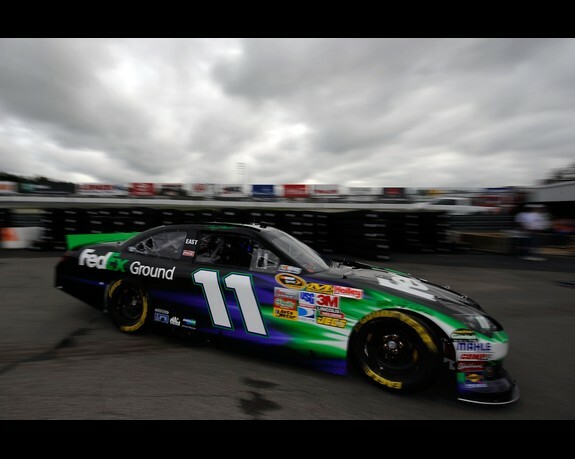 Hamlin was forced to pit road for extensive repairs, finishing four laps down to race winner Tony Stewart. Hamlin started 23rd in the 400-mile event, but a loose race car prohibited him from running in the big pack throughout much of the race. He stayed in contact with the draft while crew chief Darian Grubb worked through wedge and track bar adjustments during pit stops to help tighten up the #11 machine. A two-tire stop late in the race gave Hamlin the track position he needed to compete for the victory before the on-track incident. The finish drops Hamlin two spots to seventh in the NASCAR standings following Daytona, 92 points behind leader Matt Kenseth after 18 of 26 regular season races. NASCAR heads to New Hampshire Motor Speedway for Sunday’s 301-lap event at the ‘Magic Mile.’ Hamlin owns a Series-best 9.0 average finish among active drivers at Loudon (tied with Tony Stewart), including a victory in the summer 2007 race at the track and five top-five finishes in 12 starts. One year ago at New Hampshire, The FedEx Racing team played the fuel strategy game to perfection, overcoming early track position, a mid-race spin and an ill-handling race car for a hard-earned, third-place result. Hamlin restarted third with 56 laps to go and worked into second behind leader Ryan Newman as both were trying to conserve fuel to make it to the end of the 301-lap race. Hamlin saved enough gas to take the checkered flag third behind Newman and Stewart. The FedEx Freight service center in Belmont, N.H., the only center in the state, will be recognized with its “BNH” code letters on the b-post of the #11 FedEx Freight Toyota this weekend. What are your feelings on New Hampshire Motor Speedway?